Unlike last year’s program, which saw more than 1,000 volunteers remove 5 tons of debris from abandoned properties, Clean Sweep this year will also begin demolishing vacant buildings in those areas. To do that, a dozen St. Louis-area construction and other companies are chipping in by supplying equipment and labor to the effort. Over the course of the summerlong program, the partner companies are expected to contribute more than $1 million in equipment and labor. Better Family Life CEO Malik Ahmed said the program is part of a broader redevelopment initiative for north St. Louis. In all, Ahmed said Better Family Life hopes to redevelop approximately 100 homes near or along Page Boulevard — an effort he said would cost between $100 million and $200 million and take approximately five years. “This year, we’ll be taking buildings down that have been eyesores in these areas for years and turning them into areas of beauty,” he said. 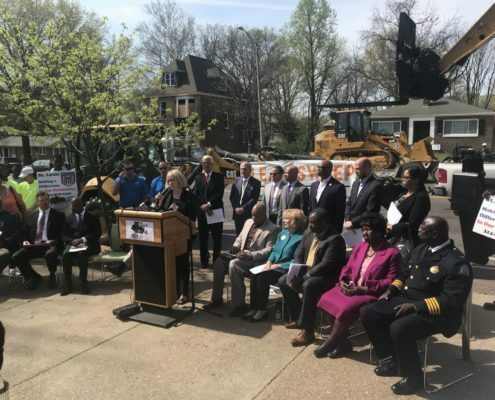 Mayor Lyda Krewson, who attended Tuesday’s kickoff event, has identified abandoned property as one of the biggest challenges facing the city because it blights neighborhoods, poses a public safety risk and drains public resources. Krewson said Tuesday of nearly 130,000 parcels in the city, 25,000 of them are vacant lots or neglected buildings. Approximately 7,100 are abandoned structures, making vacancy a bigger problem than the city can handle on its own, according to city officials. After the event, Krewson toured two nearby homes along Page — one under construction by Better Family Life and another that has been rehabbed. “By the end of the summer, four neighborhoods are going to be much cleaner and much better to live in,” she said. St. Louis Mayor Lyda Krewson tours a home a 5351 Page Blvd. that has been redeveloped by Better Family Life. Participating companies include: Associated General Contractors, Ben Hur, BSI Constructors, Clayco Construction, Holland Construction, Keeley Companies, McCarthy Building Companies, Paric Corporation, Busey Bank, Kwame Building Group, Fred Weber Inc. and S.M. Wilson. “Nobody wants to come to a dilapidated community, so it’s up to us to show people what this community can be,” said Kwame Chairman and CEO Tony Thompson. Krewson, meanwhile, wants to boost the city’s demolition budget to fund more teardowns of the most deteriorated properties. The Metropolitan St. Louis Sewer District is also funding some demolitions to create green space that can absorb rainfall. A big boost could come in court, where the city is arguing voters in April passed a small property tax increase meant to raise about $6 million a year to stabilize vacant properties for future rehabs. A majority of voters supported it, though the proposition failed to get the needed two-thirds approval. The city has filed a lawsuit arguing the proposal is governed by the state constitution, which requires only four-sevenths voter approval — or roughly 57 percent of the vote — and not the city’s charter, which requires the two-thirds threshold. “It would be a really big opportunity for us to make a difference,” Krewson previously told the Post-Dispatch.